Was at Parker & Otis, shopping for some overpriced edible hipster goods, as I am wont to do, when I spotted a writing utensil just screaming to be impulse purchased. A quick look online told me that this little lead holder was not actually overpriced, unlike the artisanal nut butter that cost three dollars more than what it would have at Whole Foods. Unfortunately for my wallet, I bought them both. 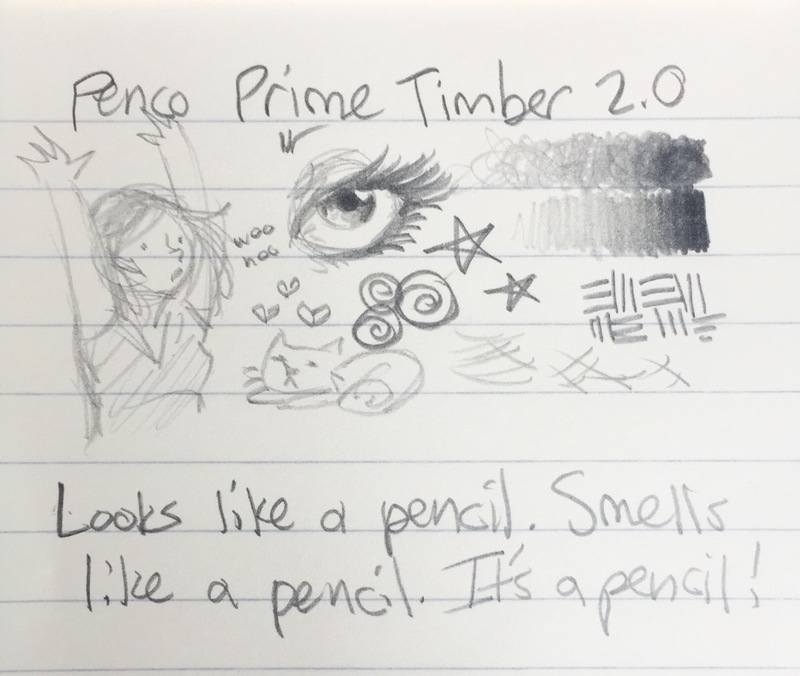 The look of the Prime Timber 2.0 is appealingly retro, though I personally only felt the appeal of the mint model (just wasn’t feeling the yellow and red, or the orange and blue, etc.). The packaging has design elements of wood and some pleasing, nearly-spot-on English phrases extolling the virtue of the wooden pencil. Needs to get a stash of these for delivering bad news. It softens impact, says so right there! The body feels and smells exactly like a wooden pencil, as well it should. The weight isn’t noticeably different with its interior non-wooden components needed to hold and advance the lead. The lead-advancement knock is satisfying, and nothing is in anyway loose or off about it. The Prime Timber 2.0 comes with a separate lead sharpener (which I generally prefer to lead holders that include no lead sharpening mechanism whatsoever). Having the lead sharpener be part of the lead holder itself is more convenient, but typically more messy. It is nice having the lead sharpener in its own little contained unit that will gather the lead shavings, rather than casting them to the wind (not that I would ever do such a thing). The plastic seems sturdy. Time will tell. My two main quibbles with the Prime Timber 2.0 are as follows. The lesser of the two evils is that I’m already seeing wear and tear in the form of paint chipping from the edges of the wooden body. I’ve only had this thing a day and a half. 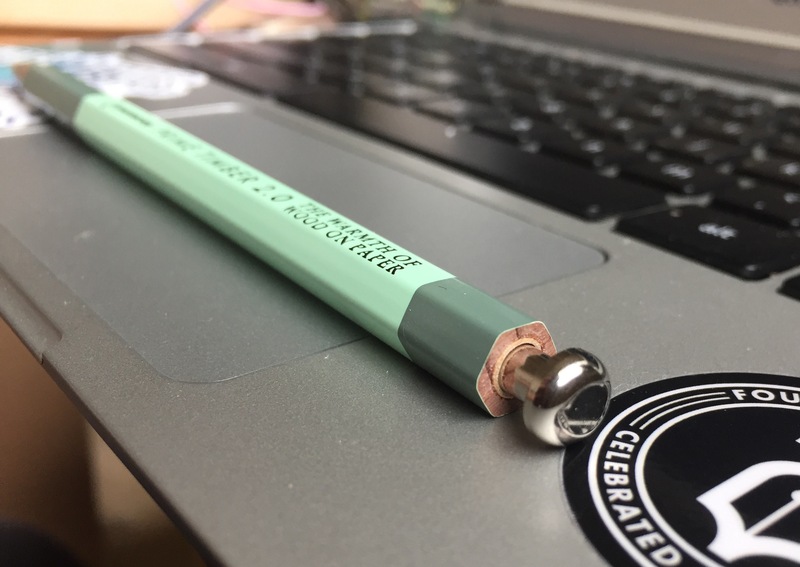 I generally think of wooden pencils as something that doesn’t need to be carried around in protective housing, so I would expect a pencil-based wooden lead holder to be no different. The major evil is how uncomfortable the wooden edges of the body are where it meets the nose cone. I fixed it, but at what aesthetic cost? On a regular wooden pencil, you wouldn’t have these sharp edges on the writing end. Luckily this is wood, not adamantium, so it’s pretty easy to sand down yourself, but it seems like an important detail that should not have been overlooked. Overall it’s a charming, solidly-built lead holder whose biggest functional issue is easily fixed. You get to feel like you’re drawing or writing with a regular wooden pencil while enjoying the advantages of a mechanical pencil. 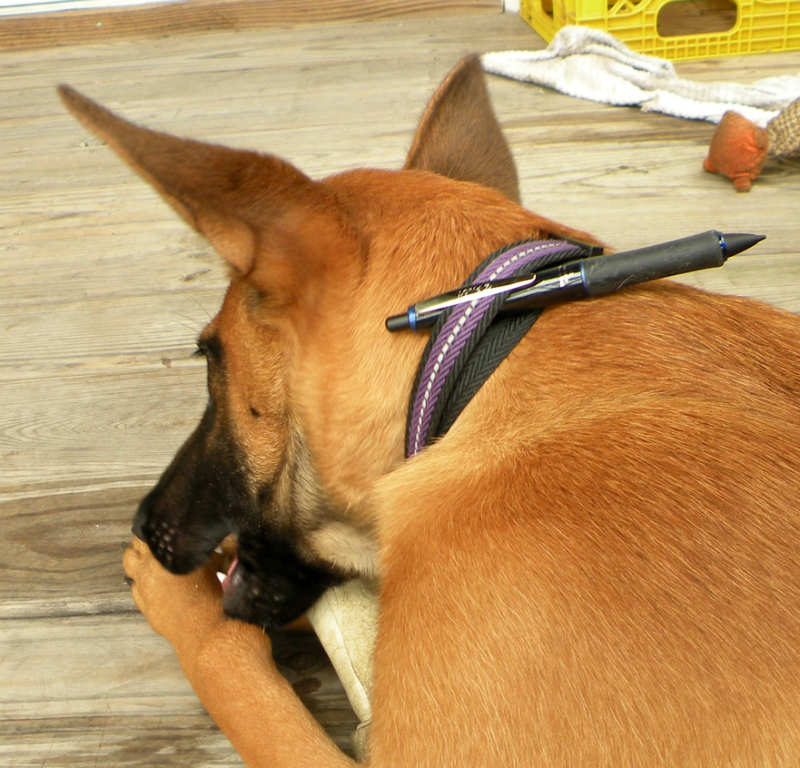 Like most lead holders it’s bring your own eraser (would be great to see a matching Prime Timber eraser holder). If it ends up breaking in half in the next year, I will probably feel differently, but for now I’m happy with the purchase. In my mind, I’ve only made it to sometime around October of last year. It really isn’t, nor can it possibly already be, nearly the end of March 2017. This is some kind of trick of the light, or perhaps part of a marketing campaign by some cringeworthy brand that thinks making any type of commercial with the phrase “going viral” is gold, rather than something that should be quietly placed in a fire and never spoken of again. Surely not part of actual reality. So, about six moons ago, I received the Palomino Blackwing Slate Drawing Book from Pencils.com for review. 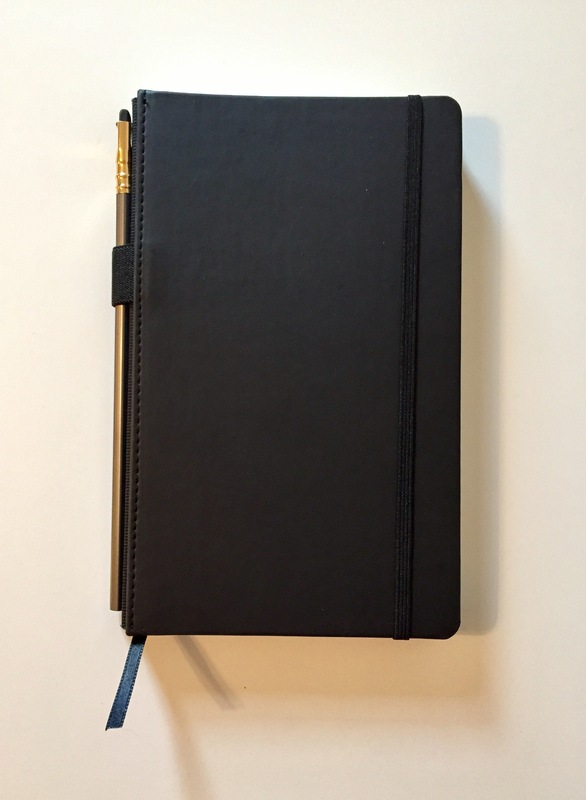 If you’re working on reviewing a Palomino Blackwing Slate, I suggest quickly getting over the first month of reverent adoration in which the notebook feels too pretty to open, or even touch. The wear-resistant polymer cover has a wonderful smooth matte feel to it, that I can successfully verify after several months of rough transport in an overstuffed lunch suitcase (it can’t really be called a box when you could probably pack a week’s worth of clothes in it) really is wear resistant. The canvas spine is a simple design element that makes the Slate stand out from all your other typical black notebooks. The pages are sewn-bound together to form a block, then the canvas spine is sewn-bound to that block for a spine that is strong, sturdy, yet flexible that opens quite flat without hassle. But the really stand out feature is that elastic holster on the spine. 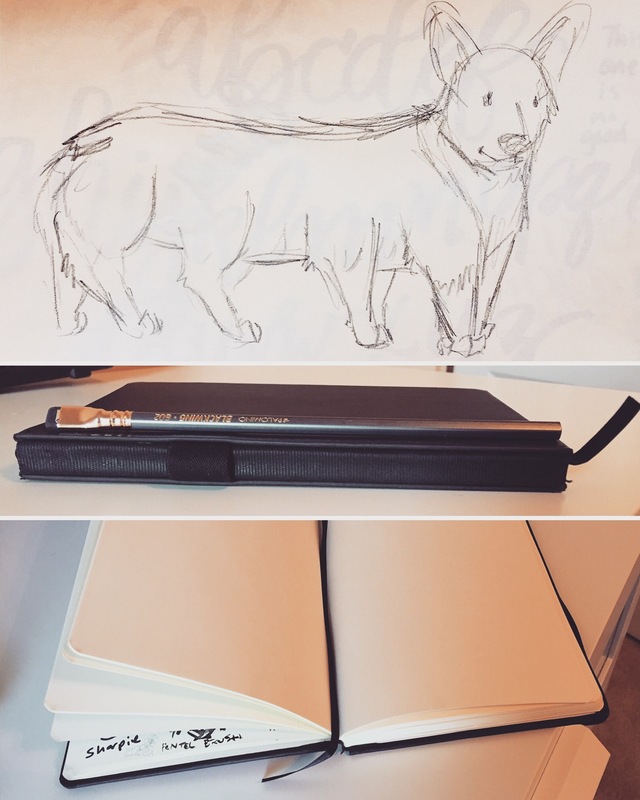 It comes loaded with the fantastic Palomino Blackwing 602 pencil, but what else can fit on there? Any pen or pencil of comparable thickness of course, but pushing the limits I was surprised to fit (one at a time, of course!) a Rotring Art Pen, the Akashiya Bamboo Brush Pen, a Pilot Vanishing Point, and even a Lamy Al-Star (though that was really pushing the limit, and might wear down the elastic more than a less girthy pen). I like the spine as a convenient, handy, yet out of the way place to stash a drawing implement so the notebook is never alone. This paper. This 100 gsm paper. This delightfully smooth, cream colored, wonderfully chosen paper is beyond what I’d hoped for. 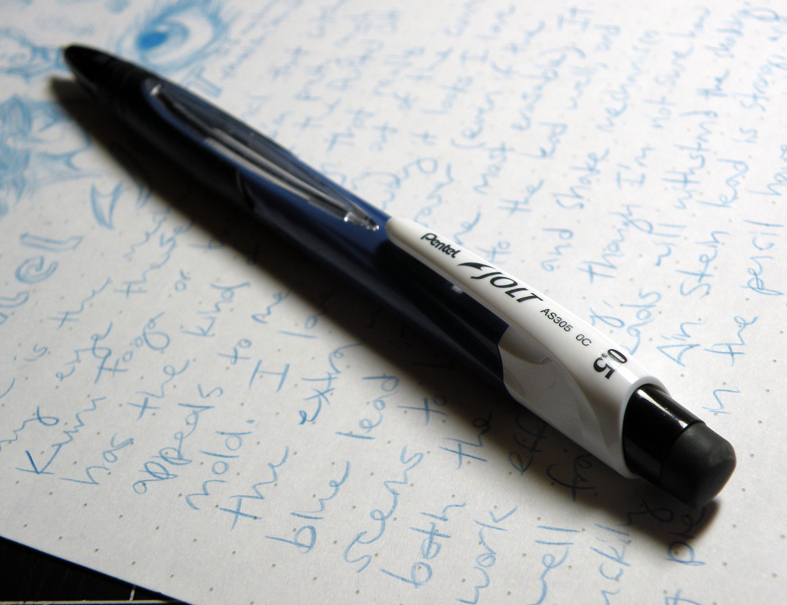 This paper is GREAT with fountain pens. I’m talking crisp lines, shading, sheen, no feathers, no bleedthrough. Let’s move in for a close-up. Delicious. 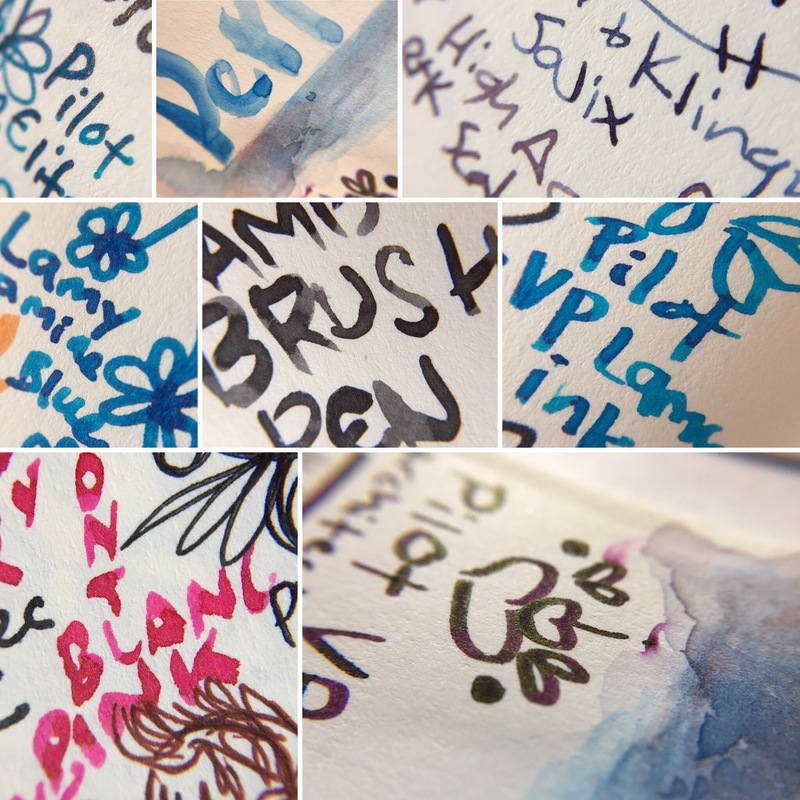 Also did well with watercolors/water brush pen, Kuretake and Koi brush pens, and PITT artist pens. Not so great for Sharpie markers, Copic markers, the Pilot Twin Marker, the Sakura Gelly Roll Gold pen, and the Pentel Tradio felt tip pen, all of which showed signs of bleedthrough. The downside to this paper is that there is showthrough so significant it almost defies logic. But you get 160 pages, in a slim and easy to transport format. It’s a tradeoff. For sketching and brainstorming, I prefer thinner drawing paper, and especially prefer fountain pen friendly paper. 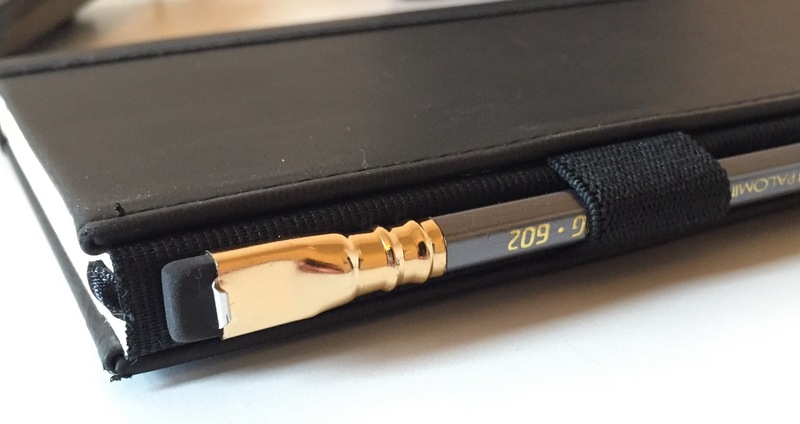 And with all the Hobonichi Techo use in my life, I have come to fully accept a world of showthrough. 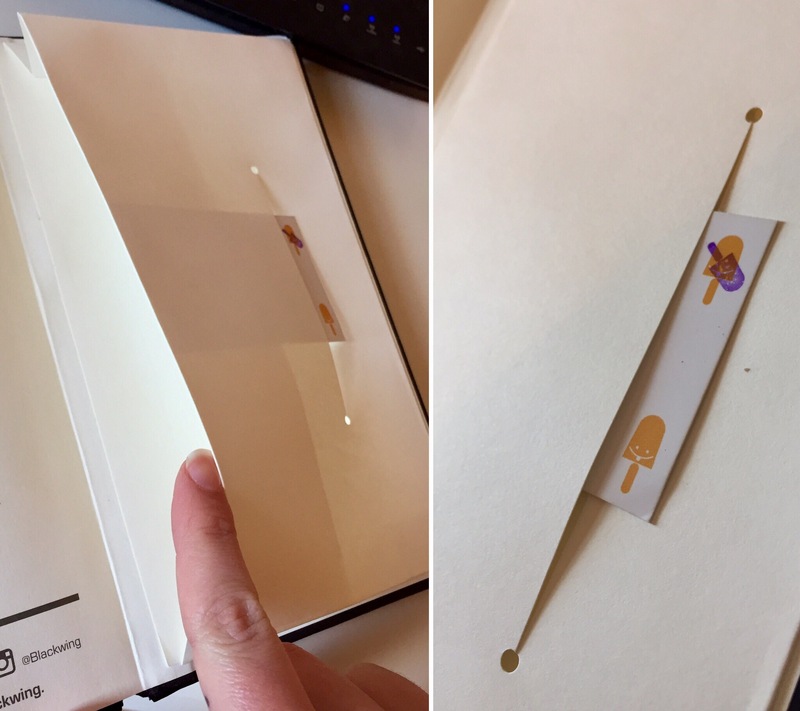 But if showthrough bothers you, this might not be the notebook for you. Clever little pocket, how could I have doubted you? The Slate also has all your typical features: ribbon bookmark, elastic closure, unobtrusive branding on the back, and a back pocket…with a slot cut into it whose purpose I could not intrinsically divine. Apparently, it’s a pocket-in-pocket for holding things like business cards in a more accessible place. I was very suspicious of the functionality. It seemed like a dangerous set-up just asking for a business card to fall out. But then I actually tried putting a card in for photographic purposes and discovered that there’s a lip there for the card to tuck into. In summary and conclusion, I love this notebook. Would I change anything? Not that I can think of. I guess you could make it in other colors?? Other sizes? But I really like this size, not too big and not too small–perfect for portability and usability. You’ve got me stumped. Good work, Palomino. Let me just say that I almost nearly did a complete review of this pencil before realizing it was a shaker model. I was this close to making a complete fool of myself! And had I not written this, you would never have known! The Dr. 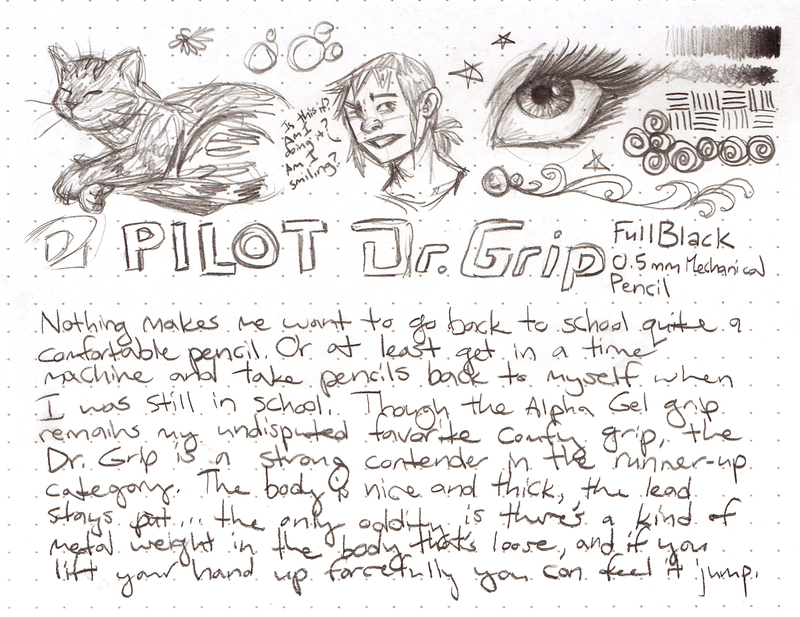 Grip Full Black mechanical pencil is every bit as attractive and its grip every bit as dust-collecting as its pen counterpart. The grip itself is more firm than the Uni Alpha Gel grip or the Pentel Selfit grip, while still possessing a little squish. The little weight of the shaker mechanism gives good balance to the pencil, but does bounce and make a noise if you lift your hand quickly. But maybe with enough practice I could work that to my advantage and shakerize to advance my lead as needed as I finish a line of text. Personally I find the shaker mechanism fun but a bit unnatural, so I don’t quite know how to evaluate them. What makes a good shaker mechanism? Do they make Dr. Grip pencil commercials of kids shaking these pencils around to a fresh beat until little sticks of lead go flying everywhere? MYSTERIES ABOUND. The shaker works, that’s all I can say, and I doubt it will ever be my go-to default way of advancing lead. But it’s good to know if I get my pencil glued to my hand and my other hand is lost in an unspecified tragedy, I can advance the lead without needing to be able to press the knock. The lead stays securely in place, and the eraser is your typical negligible little thing, its stark whiteness hidden away beneath a matte-black soon-to-be-lost cap. 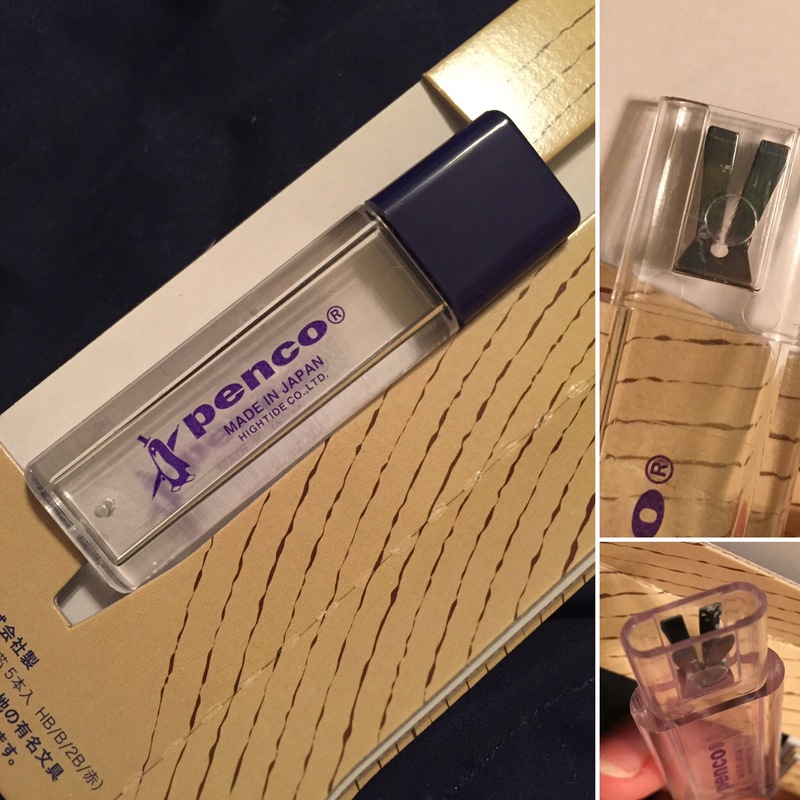 Thanks to JetPens for providing this sample to review! This pencil was the very first item I put on my JetPens wishlist nearly four years ago, when the madness was just beginning to take hold, back when more than ten dollars for any one item seemed exorbitant, luxuries beyond the comprehension of my budget. Onto the wishlist this went, a maybe-one-day dream, until to my surprise I opened the bubble mailer to see that JetPens had sent me this sample to review. Inside the clip, I see the year stamped “2006.” I think I’ll consider this both a birthday (June 24th) and belated high school graduation gift (2006). Thank you JetPens for providing this sample! Does this remind you of a robot cigar? A high-class fancy party robot cigar? The body is shiny aluminum, specially treated (so I’m hoping it will prove durable). The accent is rubber, like the grip. The whole thing looks fantastically executive, in spite of being a magnet for fingerprints and little debris specks. Guess what happens when you post the cap? As you push down and it snaps into place…THE LEAD ADVANCES. Either right now you’re hearing a choir of dragonfly angels singing joyful hallelujahs, or you’re thinking, “DUH, why would it not?” Hypothetical second person, it only takes one pencil in your life where that’s not the case to turn such an intuitively expected bit of design into a delightful surprise. If you grip low (like on the nose cone), then this design won’t suit you, but for me the grip falls right in a goldilocks zone of comfort. The rubber has just the right amount of contour, and the material is neither too smooth nor too tacky. 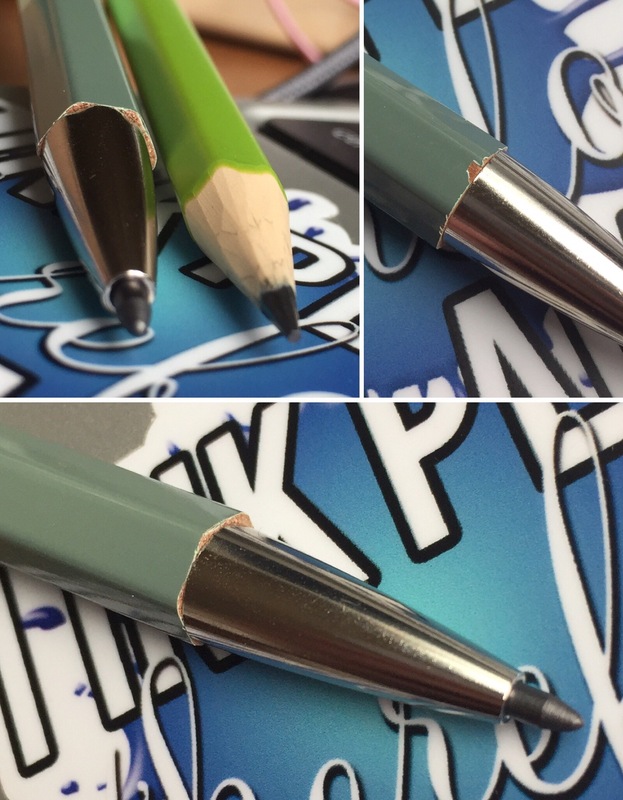 The pencil itself has a well-balanced heft to it, with or without the cap posted. Feels like I should be penciling in some significant or substantial things. Book me to fill out your corner-office day planner today! Starting at a zillion dollars. 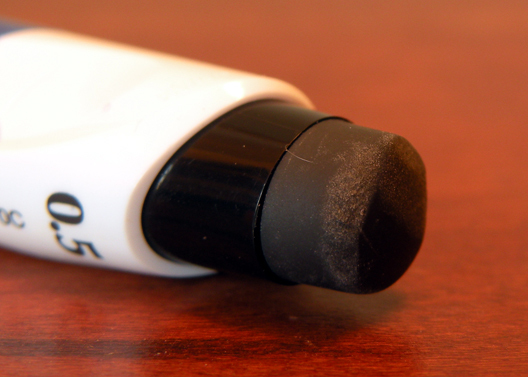 Technically, there’s an eraser. Practically, I would save it for only the most dire of erasing emergencies. If lives are somehow on the line, and erasing is the only thing standing between you and certain death. The eraser is the lead stopper; to get to it, you have to unscrew the grip from the body. Remember this when the time comes. It was foretold at the hour of your birth that one day you would save the world with a tiny eraser. Probably. It’s lead! What more can you say? The sleeve holds the lead securely, and the cap keeps the whole stabby lead situation from escalating into puncture wounds if you’re reaching in somewhere blindly to retrieve this pencil. 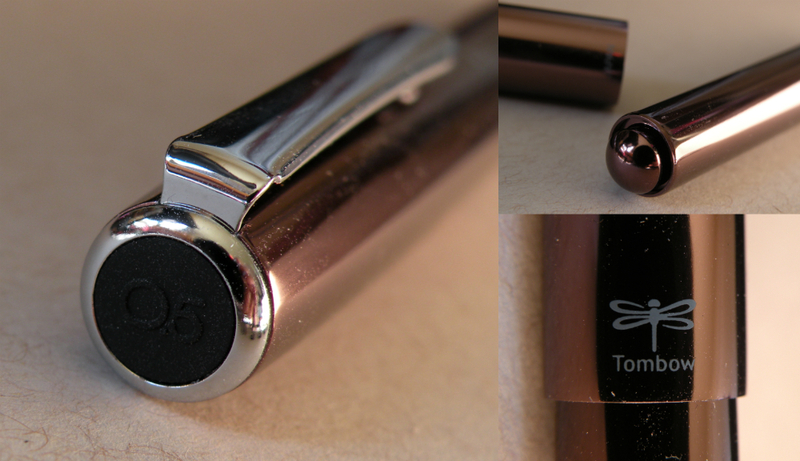 The Tombow Zoom is a simultaneously shiny and classy mechanical pencil that seems to hit just about all the right notes. Thanks again to JetPens for providing this sample! What’s better that a Jetstream? Several Jetstreams rolled into one. 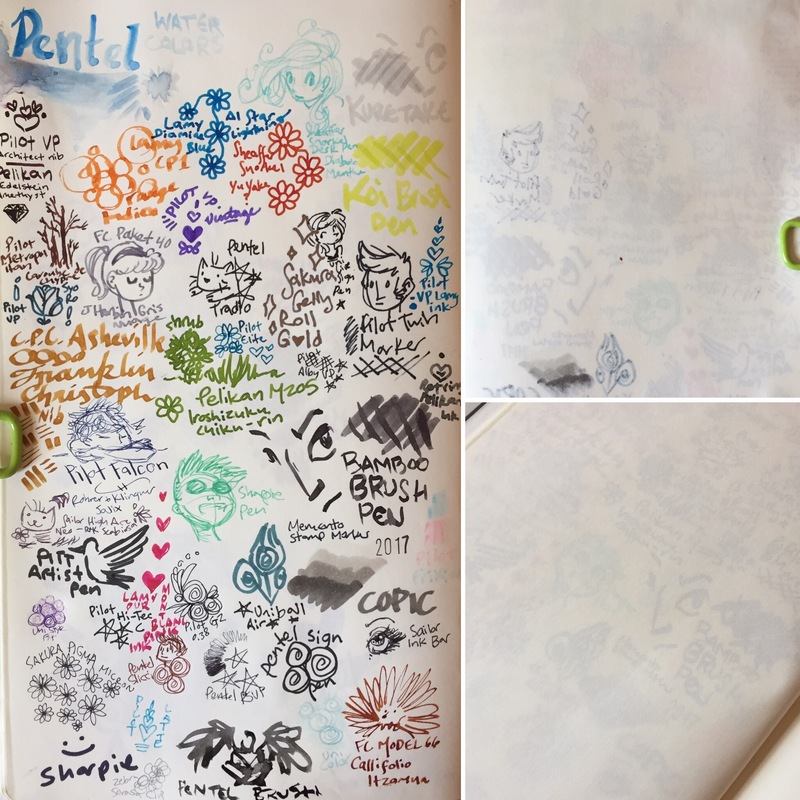 Thank you to JetPens for providing this sample! The body is simple and professional, with tasteful silver accents. 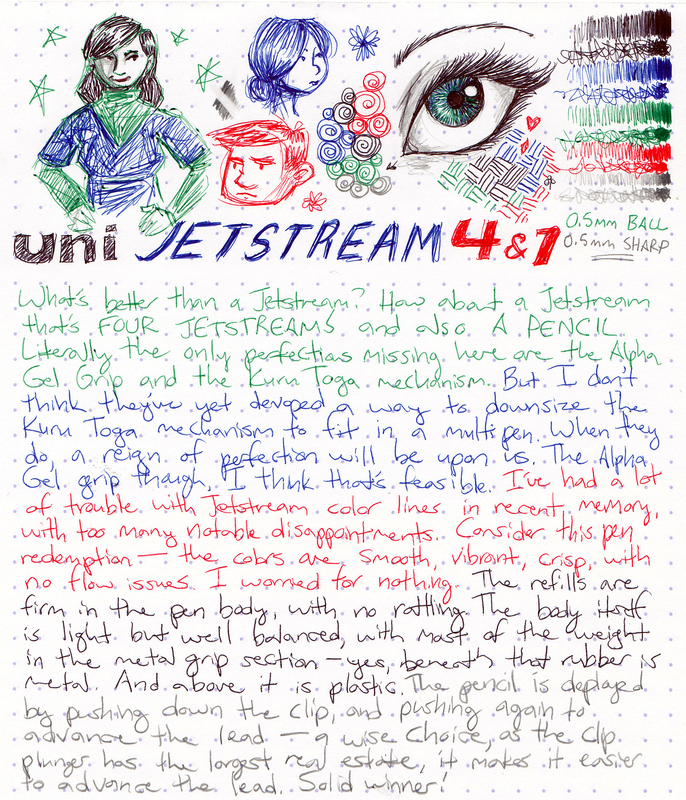 The markings to denote refill colors are unobtrusive—quite appreciable, as multipens are ever in danger of looking like rainbow vomit with their many-colored plungers. The sticker on the body was easily removable and left no residue. 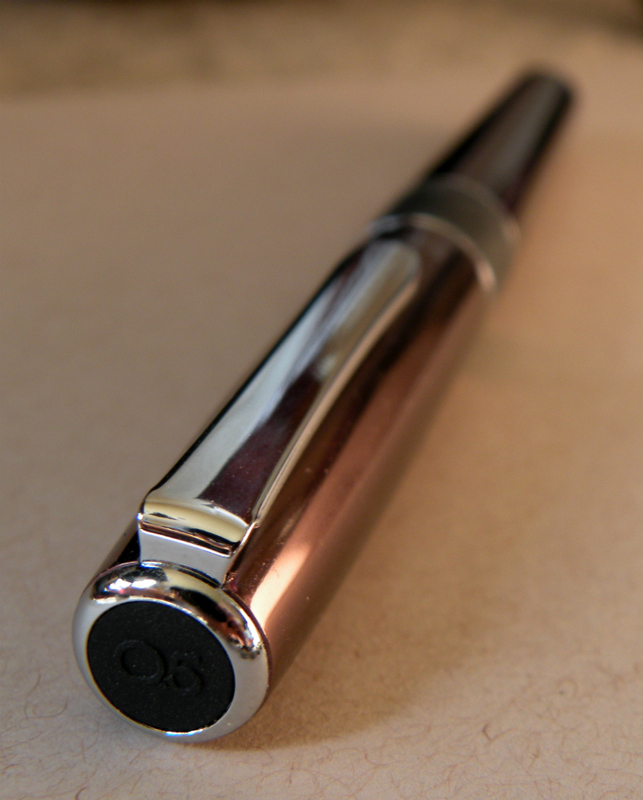 Coupled with the subtle branding imprinted on the clip, you’ve got a pen that looks good and keeps distractions low key. Things I was not expecting to find in here: metal. Things that all of in here consists of: metal. 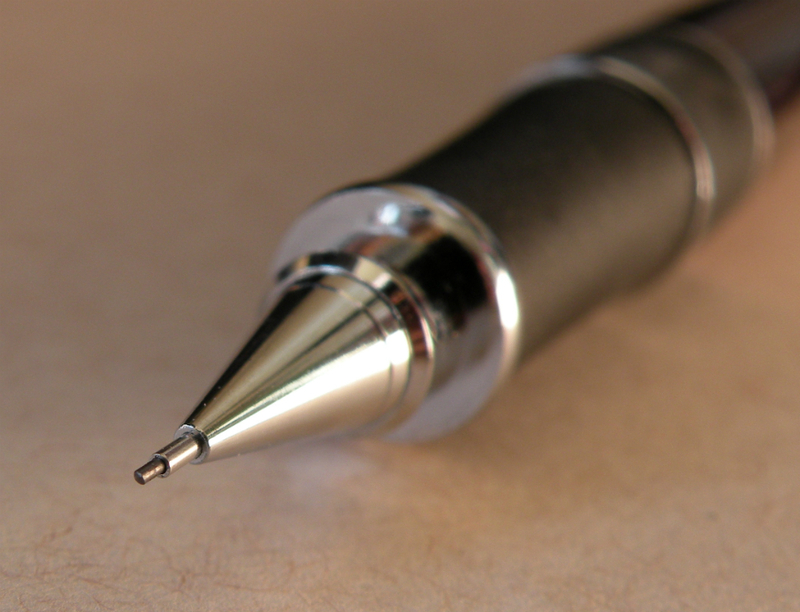 The pen itself is nicely balanced, with the majority of its light weight focused lower, in the grip. 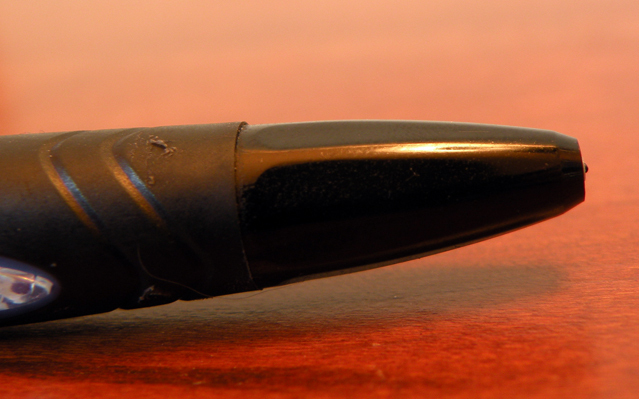 The grip section is metal, with a nice grippy rubber on top (though it would be PHENOMENAL to have the grip be Alpha Gel instead, that would probably make the pen unbearably wide, and would collect more debris than this grip does). 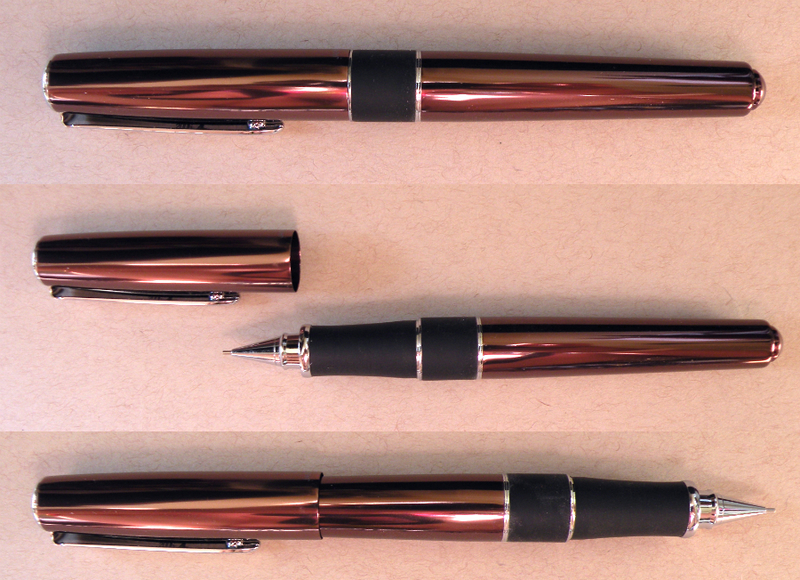 The upper half is mostly plastic (excepting the clip), and the overall composition of the pen makes it pretty comfortable for a longer writing session. Normally I’m not a fan of easily-lost caps covering uselessly tiny erasers, but this cap hold surprisingly firm to the pen. It’s not going to get lost unless you set it down and forget to put it back on. The eraser itself isn’t much to speak of—more of an emergency provision. 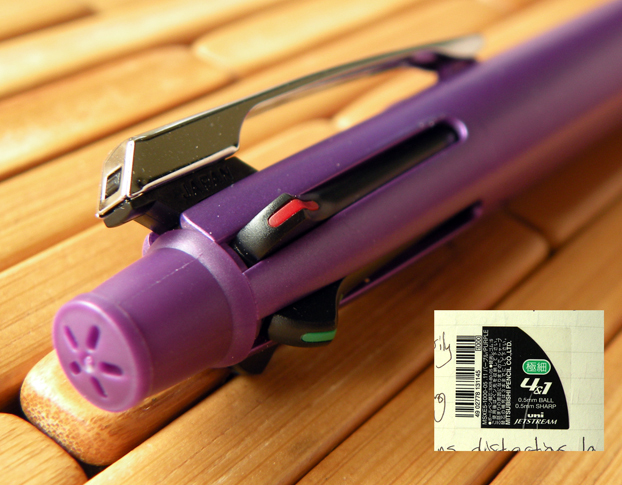 The pencil component is deployed by pressing down on the clip, and lead is advanced by pressing the deployed clip down again. It’s a wise design choice, providing a larger plunger for easy use of the pencil while concealing it design-wise in the clip. The only improvement I’d like to see here is for Uni to find a way to shrink the Kuru Toga mechanism into the size of a multi pen refill. 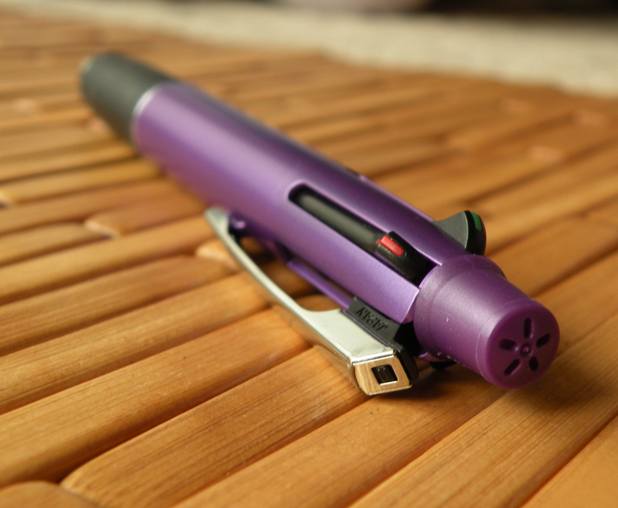 A multi pen made of Jetstreams and a Kuru Toga would be unstoppable. If you need more colors than this, be sure to give yourself a stern lecture about how back in my day we didn’t have any newfangled ink colors. Pens were also used uphill both ways. In the snow. I’ve had some problems recently with certain Jetstream color models not living up to the Jetstream name—consider this pen redemption. All colors perform smooth and vibrant, as a Jetstream should. 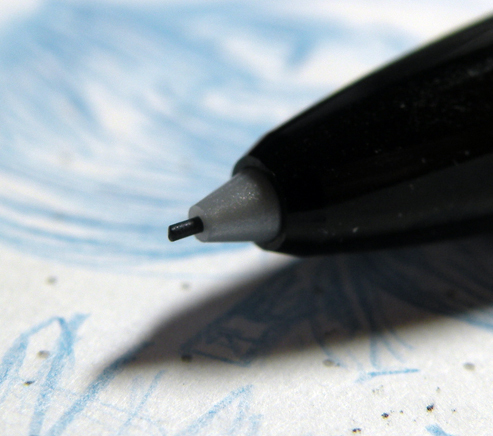 The 0.5mm provides crisp lines that glide onto the page with almost no pressure whatsoever. The barrel is a bit wide, as almost all multipens are, but it’s not unwieldy—only if you really prefer a slim pen will it be something that might bother you. And, after handwriting out this whole review, the side of my hand is clean. This is the Jetstream I know and love. 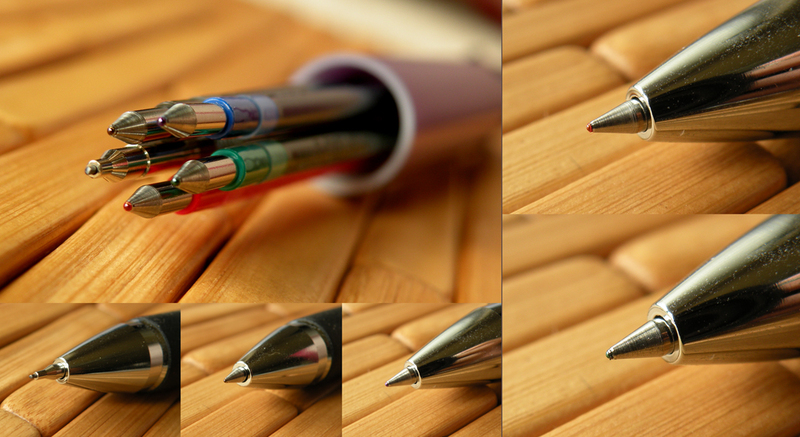 If you use red, blue, green, and black ballpoints on a regular basis, you’ve got to give one of these a try. I’m thinking especially professionals and students in the science, technology, engineering, and math fields, plus anyone who needs to mark up papers, or just likes having access to all the traditional pen colors at once. 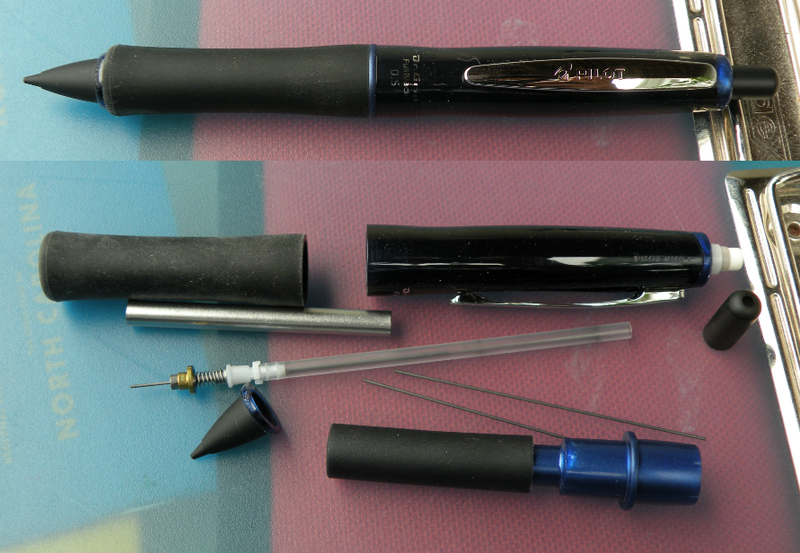 The refills are smooth, the mechanisms solid, and the pen looks good. Classic Jetstream goodness! 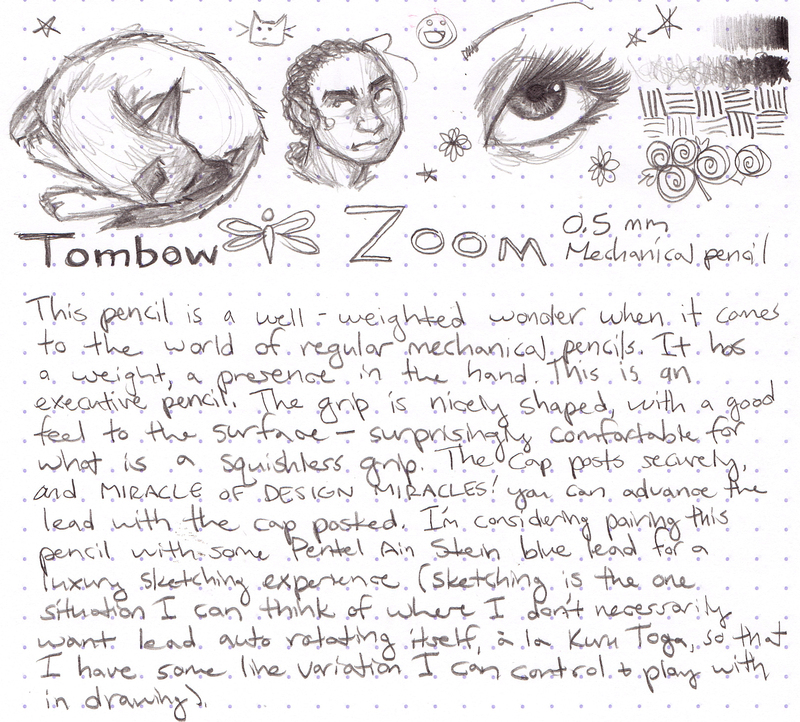 Ever since the Kuru Toga came into my life, I haven’t tended to give much thought to mechanical pencils. 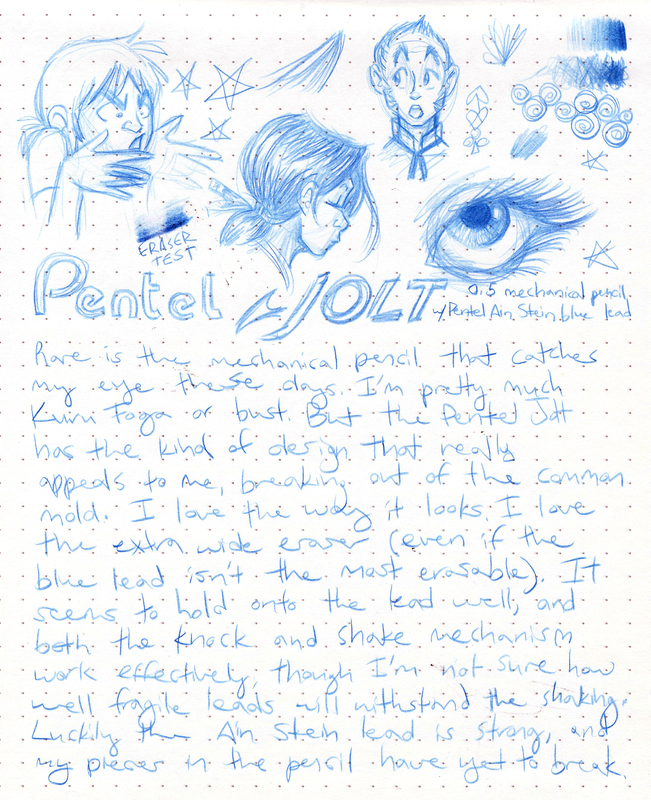 But the Pentel Jolt has kept a stylish place in my heart, and it’s high time I got around to reviewing it. Style style style style STYLE. I love the look. I love every part of the look. 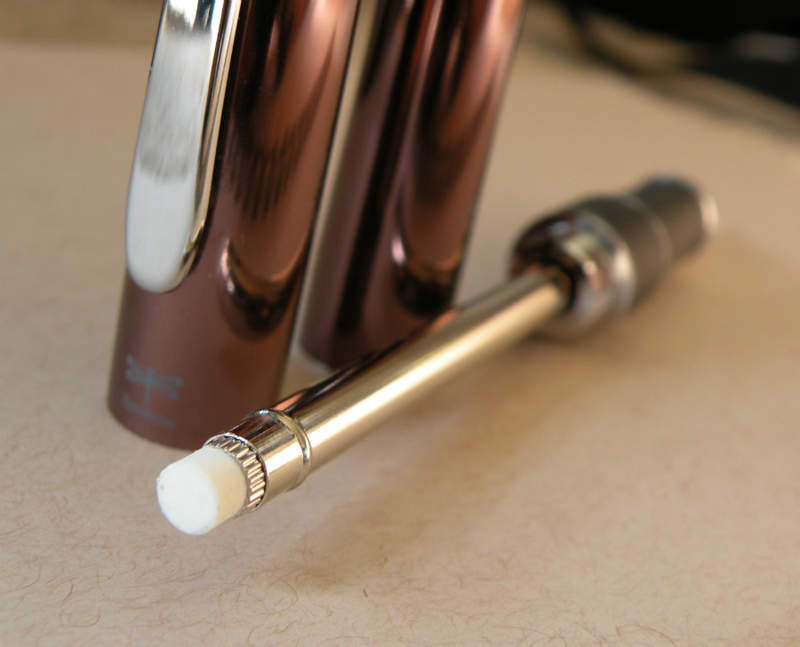 I love the faceted nosecone (and I love that it allows the tip to be retracted). Just a solid YES. Even the branding looks good. 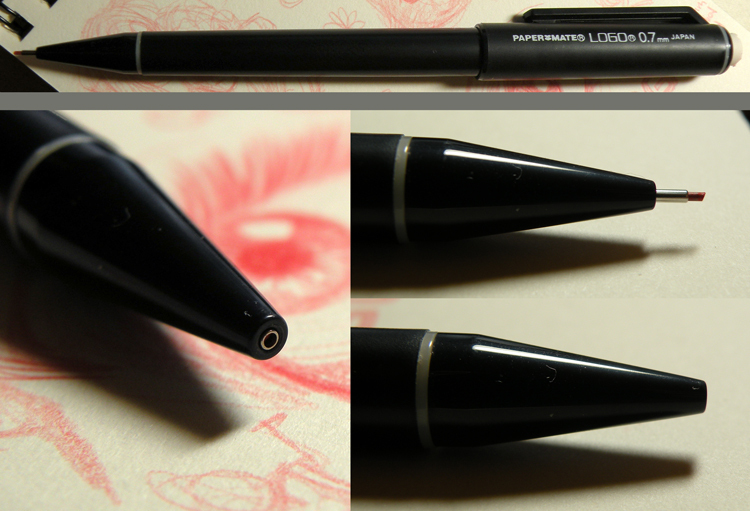 A++ on this design, Pentel. Please call up whoever worked on this design and remind them of what a good job they did. Not content with mere aesthetic mastery, the Jolt hits as many functional points as it can. Number one in my heart is this extra large, wide black eraser. 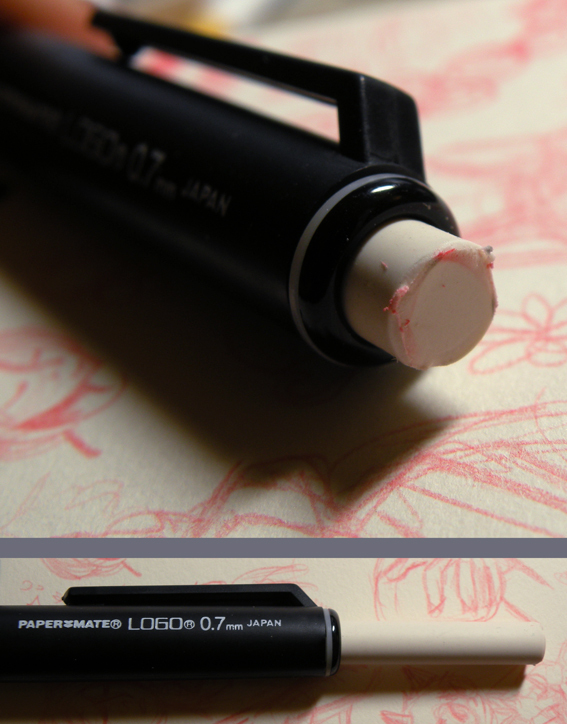 The only improvement there would be for Pentel to make it out of their hi-polymer black eraser material. I don’t have many shaker pencils, so I don’t know exactly how to evaluate them. You shake the pencil, and like you’re some kind of wizard having a fit, lead magically advances from your flailings. 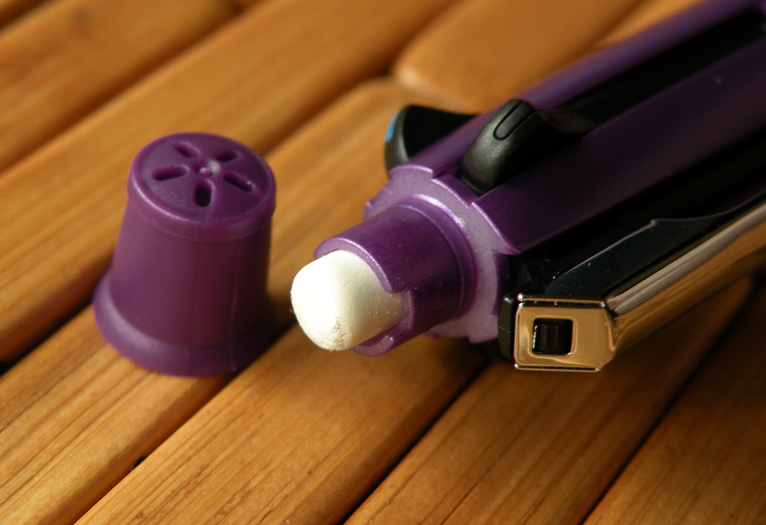 Or, if you’re more traditionally inclined, you can advance the lead by pressing down on the eraser. 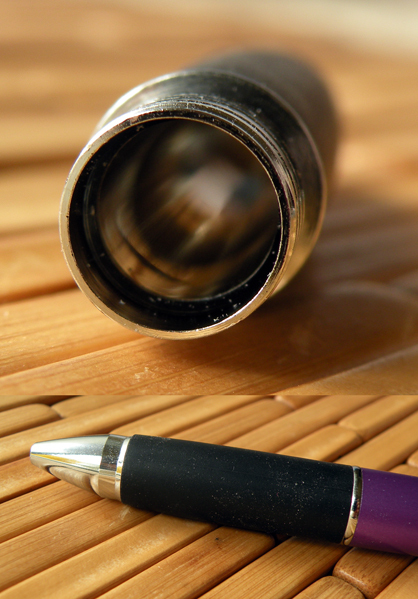 I forget what kind of lead it came with; I loaded it with Pentel’s Ain Stein enhanced 0.5mm blue lead. It’s smear resistant, with a reinforced silica core. Plus it makes all your drawings look cool. At a little under $3 and widely available in regular office supply stores, the Pentel Jolt is probably one of the best-looking mechanical pencils you can get out in the wilds of the American market. This right here is a pencil of my youth. There was always that minimalist robotic cool 90s aura to it, and when I saw one at my local pen store I had to pick it up for a little review. Dig around in ye olde pencille drawers, I’m sure you’ll find one of these there. The Logo has two main features to it: you can secure the lead sleeve away up in the body, and you’ve got about 32mm worth of rubbery white twist eraser. I TRIED A LOT OF WRONG WAYS BEFORE I FIGURED THIS OUT; YOU WOULD BE AMAZED. The top pulls away from the bottom. Voilà. The secret is out; the mystery, solved. 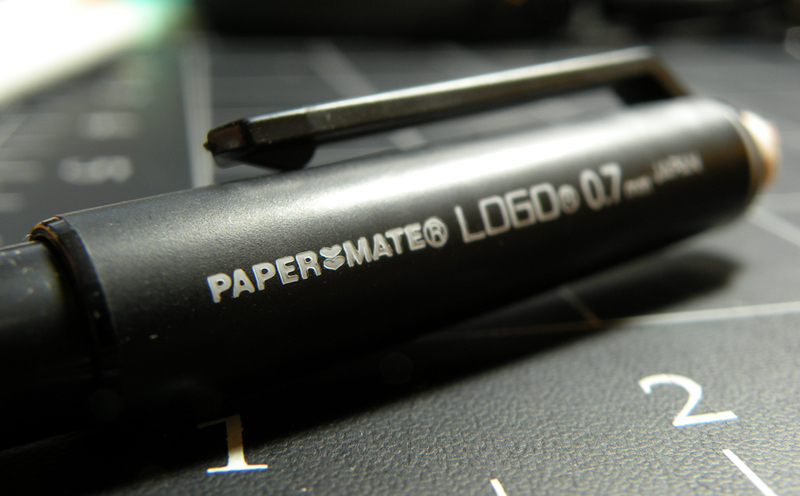 No big bells and whistles on this one, but the Paper Mate Logo still has a spot in my heart. Office Depot lists them as available (though way overpriced) on their website; you can get a dozen of ’em on Amazon; or there’s always my local pen store, Office Supplies and More!